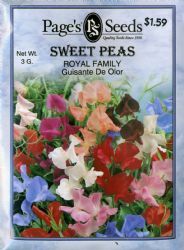 Sweet Peas are one of the most fragrant annuals. Royal Family has a wide range of colors and bi-colors. Sweetly scented, crisp flowers bloom on long stems growing on a vine. Blooms begin mid-summer from seed sown in early spring. Mixed colors make delightful bouquets.